Whatever game you play, whatever scale you choose, there is always that moment when you need to select miniatures. For many of us gamers that’s one of the fascinating moments – the whole excitement of searching for new and not so new miniatures. But then when the first dust settles many questions arise: Are they good quality? Are they going to mix well with other manufacturers? In this series of articles, I will try to find the answers to those questions. Please if you notice a typo, grammar error or anything wired feel free to contact me. The Elves were one of the first releases from Mantic. Originally released in 2009, they were probably one of the most commented models made by Mantic. I will give you my view on them at the end of this article. 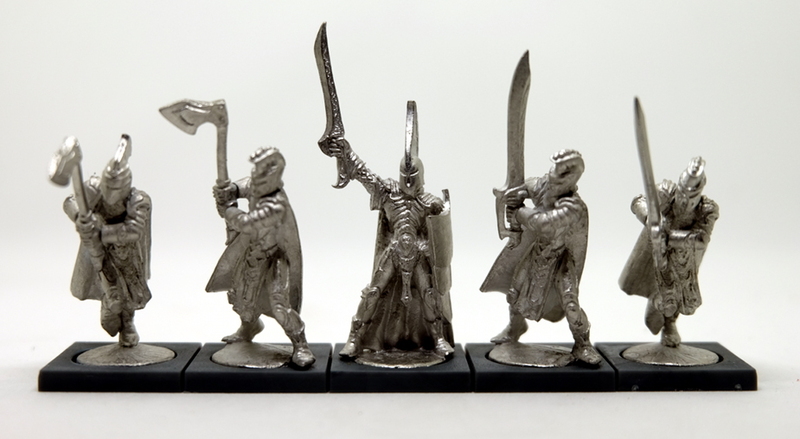 In general Mantic produce miniatures in hard plastic with some addition of metal and resin models. In general, the quality of castings and moulding is good. All parts fit nicely, there is not a lot of flash lines, and all models come with appropriate bases. Let’s start with the miniatures that are going to be the bulk of an Elven army. 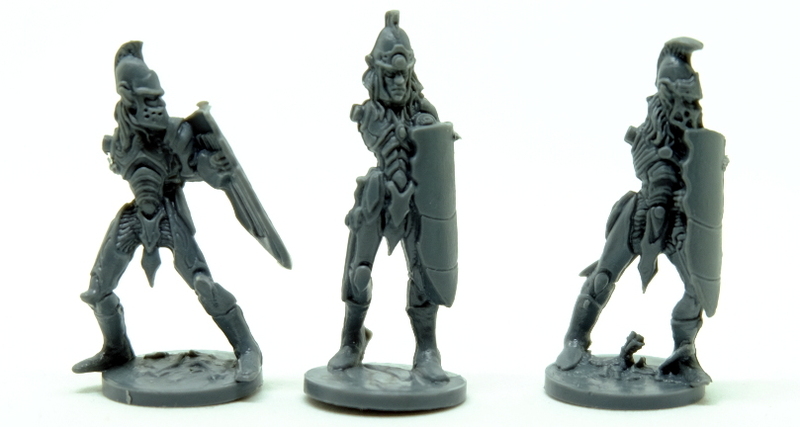 Well, is hard to say a lot, there are enough parts to build spearmen and archers, with options for command groups. 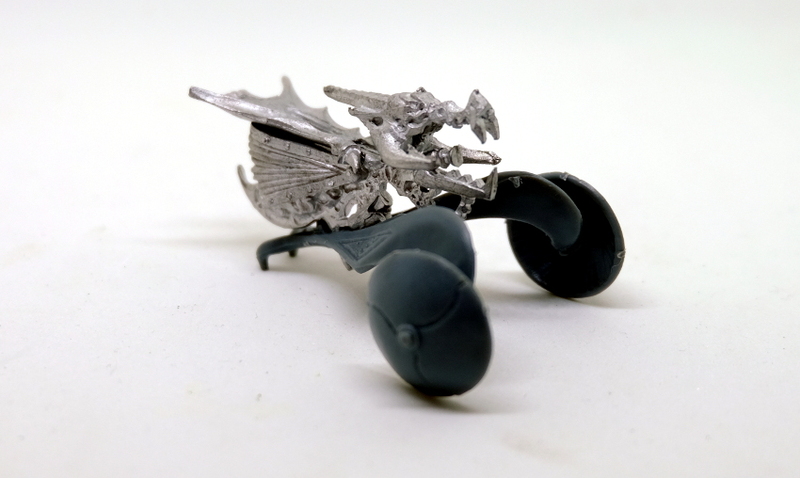 Sprues also include some additional stuff like for example dead a body or broken shields. Nice variety of poses is always a big plus for any set. The miniatures are easy to build so even a less experienced wargamer can build the whole boxset during one evening. The amount of detail makes the set reasonably simple to paint also. Let’s take a closer look at the first metal set in this review. 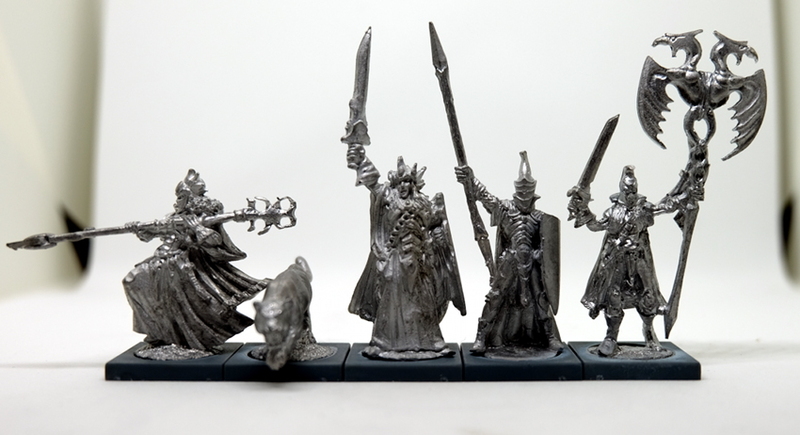 In a box, we find all we need to build ten models including elements for a musician, standard bearer and a Champion. There is not a lot of variety in poses: only two designs for body and a third for the Champion, two options for heads and weapons choices. I must say that the metal figures look a bit better than the plastic ones. Details are sharper and deeper than in the plastic sets which is not surprising in the case of metal models. As far I’m aware this set is now produced in “restic” and also got some additional weapons. Both models share the same plastic parts and crew, and the only difference is that in the Dragons Breath box we will find metal parts to build this variant of the war machine. The crew is similar to the plastic Spearmen/Archers (i think they share the same body and heads). Both crew and war machines are easy and quick to build. Every army needs a general and heroes who will lead the troops to the ultimate victory, and that is what the King Court set provides. So we get an Elven King, an Elven Mage Queen, an Elven Prince, an Elven Standard Bearer and a cat. The models are more detailed than previous plastic sets or Palace Guard. I’m pleased with the Elven King and Mage Queen; the Prince is a bit too generic for me. 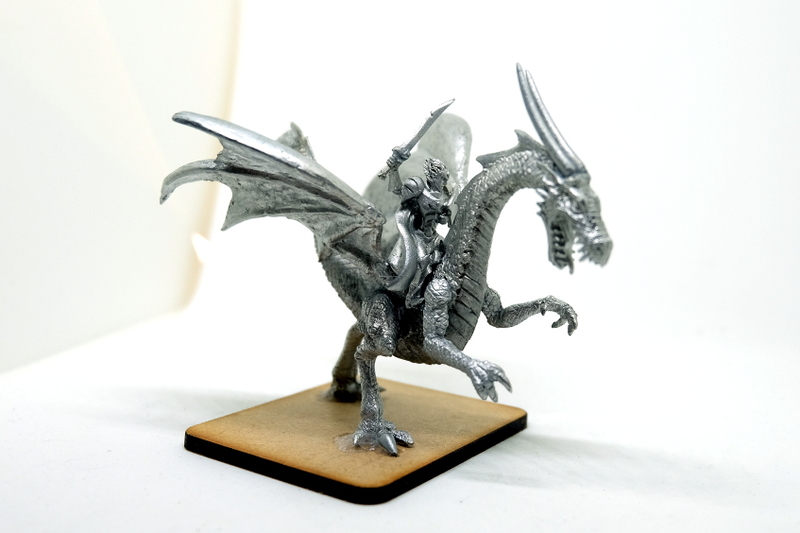 Last but not least is this “little puppy” – a Lord on The Battle Dragon. Probably my favourite model of the whole lot. Unfortunately, this model is now out of production and was replaced by a newer design which in my opinion is inferior. The dragon fits 50mm square base, and that’s a big plus for me as I’m not a massive fan of super-duper oversize models that occupy half of the table, not to mention it fits nicely to the concept of basing in Battle Havoc!. This model requires a bit more skill and experience in assembling compare to others, as metal parts are harder to work with. Well, and now time for some “sort of” summary. As I mentioned at the beginning, the Elves have a very diverse opinion. First of all, if you are looking for miniatures that are easy to put together and quick to paint and looks nice, I can easily recommend Mantic products, but on the other hand, if you are looking for supper detailed models with tons of things to paint… well do I need to say it? It is just not here, and I think that’s part of the concept behind Mantic products. Like it or not, that’s how they are done. Now, the design. Okay, they’re not a copy of miniatures by a well know company from Nottingham. From my perspective, that is a very good thing, and I appreciate this approach but, is also probably the most significant weakness/disadvantage for many. 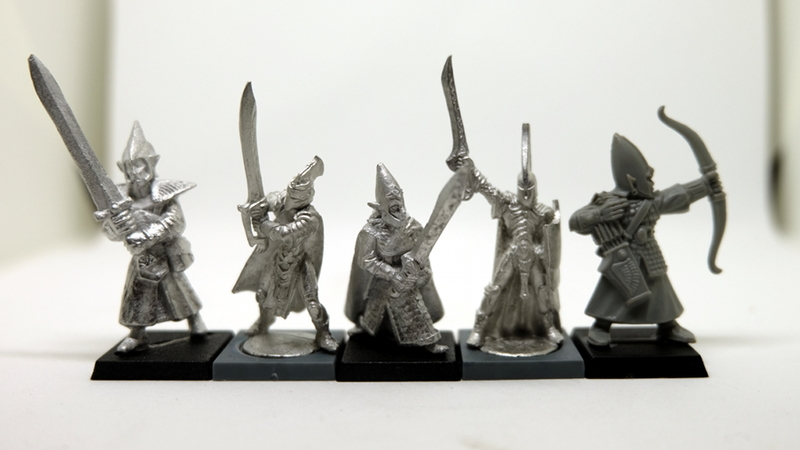 The figures are indeed slender which mean they are not going to mix very well with other manufacturers, definitely not in one unit, this also means that if you want to use them as a base for your army, you will need probably stick to Mantic products. That’s all for today, hope you enjoyed the review, and feel free to left any comments.